I have this theory about people who cook. I think that you can tell if somebody is serious about cooking, and I mean really serious, after a quick rummage through their kitchen cupboard. That might sound obvious, but it’s not the weird and the wonderful I’m looking for. Everybody has barely used bottles of this and that kicking around, leftover from some single-shot experiment. Anybody who needs a barely used bottle of saké knows where to come. I’d look for the stuff that gets used, the things that form the staples of that particular kitchen, the backbone. Everybody has a different list, and mine fluctuates all the time in a sort of Premier League fashion. Sometimes, there are promotions, other times, there are relegations. Something will emerge that I’ll use for a little while then forget about, a passing fad, a fashion. Other times, something takes a firmer grasp and claims a permanent place in the cupboard. That’s happened with these wonderful and versatile preserved lemons. So useful, so easy. There’s nothing to making preserved lemons except time and patience. The recipe is nothing more than the very liberal application of salt, a good dousing of lemon juice and a month of maturing. 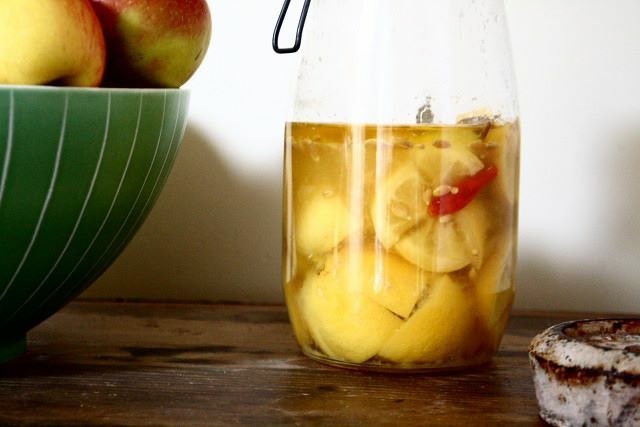 The best vessel for preserved lemons is a big Kilner jar, the kind with a swing lid and clip. Sterilise it with boiling water, then leave it to air dry. Start with about six unwaxed lemons – you may be able to get more into the jar – cutting each in half and then scoring a deep cross across each cut face, without cutting all the way through. The lemon should splay open, but be held together at the base. Stuff each lemon half with about half a tablespoon of coarse sea salt, pushing the salt deep into the slits. Drop each salted lemon half into the sterilised jar, and then push them tightly together with a wooden spoon. Close the jar and leave it alone for a week. The salt will start to cure and preserve the lemons, and they’ll leach a lot of juice. After the week, get to work again with the wooden spoon and press the lemons down as hard as you can, so that they lose as much of their juice as possible. Add a large red chilli and a couple of big sprigs of rosemary to the jar and push them under the surface. The lemon juice should cover everything, but top it up with more freshly squeezed lemon juice if it doesn’t. Drizzle in a thin layer of olive oil to cover the top and keep the air off the surface of the fruit as it preserves. Store in a cool, dark place for at least a month, longer if possible. The lemons will turn darker the longer they’re kept, and their flavour will improve. Preserved lemons have a place in countless Arabic, Israeli and North African dishes, and they’re a useful addition to simple dishes like a salad or a bowl of couscous. They give an explosive boost of citrus flavour anywhere normal lemon would normally be used.
. An early contender for cookbook of the year, and a probable winner. Cool – I’ve been wanting to do this for a while, but have been waiting until the weather warms; I like the Chilli idea, too. See also: Sun (Oven -dried) Tomatoes – you got any recipes/hints for that?